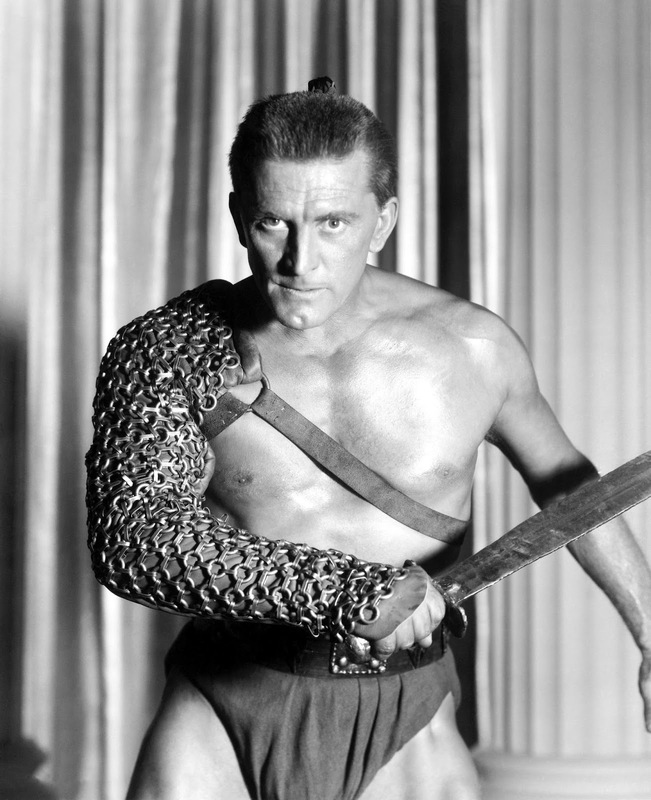 Spartacus (1960), starring Kirk Douglas, is one of the old Hollywood favorites airing on TCM this week. This week, TCM is wrapping up the 31 Days of Oscar with great movies featuring Rita Hayworth, Emma Thompson, and Kirk Douglas. Plus, they are celebrating great stars like Jean Harlow, John Garfield, and Merle Oberon. So, without further ado, let's jump right in to this week's offerings. Just a note: the highlighted text has links to full length articles. Birthday tributes: Jean Harlow on Thursday; John Garfield on Friday. The Essentials pick (airs Saturday nights at 8): Director Billy Wilder's classic romantic comedy Sabrina (1954), co-starring Humphrey Bogart, Audrey Hepburn, and William Holden. Sunday Prime Time: The Doris Day-Rock Hudson rom-com Send Me No Flowers (1964) at 8 p.m.
Best Day to DVR: Wednesday evening, which features two of Kirk Douglas' best performances. TCM continues its 31 Days of Oscar with a bunch of great films. Three Daytime Picks: James Cagney fans will want to get up early for Captains of the Clouds (1942) at 9 a.m. The dynamic star plays a Canadian bush pilot turned World War II flyer with his characteristic energy. The Yearling (1946) at 11 a.m. is a glorious Technicolor masterpiece about a boy's (Claude Jarman, Jr.) coming of age in 19th century Florida. 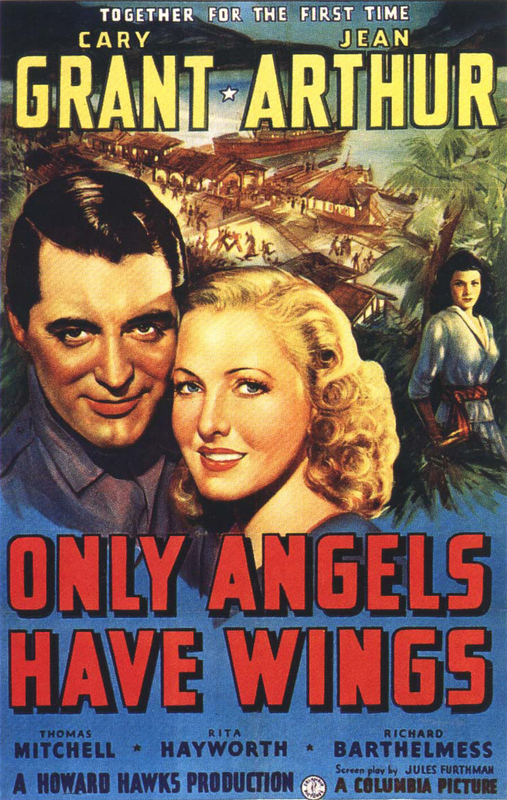 Flight Commander (1930) at 6 p.m. is an innovative film about World War I flyers directed by Howard Hawks. Primetime Lineup: The lineup features two Oscar-nominated films starring Rita Hayworth. 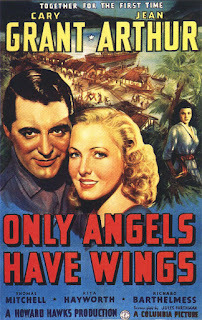 Only Angels Have Wings (1939) at 8 p.m. finds Hayworth in her first major role as the young wife of a pilot (Richard Barthelmess) who has been accused of cowardice. In The Strawberry Blonde (1941) at 10:15 p.m. Hayworth plays a bombshell who comes between dentist James Cagney and his suffragette love, Olivia de Havilland. One Late Night Pick: Charles Laughton plays the lonely bellringer, Quasimodo, in The Hunchback of Notre Dame (1939) at midnight. Three Daytime Picks: Victor McLaglen plays a tortured Irish Republican Army turncoat in director John Ford's masterpiece, The Informer (1935) at 6:30 a.m. One of director Alfred Hitchcock's best forties films is Lifeboat (1944) at 10:15 a.m. about a group of boat passengers who struggle to survive after their ship is hit by a German torpedo. The classic fifties science fiction epic Them! (1954) at 1:45 p.m. finds James Arness and company battling giant mutated ants (yes, you read that right). Primetime Lineup: TCM is featuring two of actress, director, and screenwriter Emma Thompson's best films of the 1990's. The Jane Austen adaptation, Sense and Sensibility (1995), at 8 p.m. features one of the late Alan Rickman's best performances. Downton Abbey fans won't want to miss The Remains of the Day (1993) at 10:30 p.m. about a repressed English butler (Anthony Hopkins) who has a tortured romance with a housekeeper (Thompson). One Late Night Pick: If you've never seen Citizen Kane (1941) now is the time to set your DVR. It's on at 5 a.m. The last round-up of 31 Days of Oscar. Three Daytime Picks: Caged (1950) at 7 a.m. is a crackling film noir about life in a women's prison that features Oscar nominated performances from Eleanor Parker and Hope Emerson. Johnny Belinda (1948) at 8:45 a.m. is the touching story of a deaf-mute woman (Jane Wyman in an Oscar-winning performance) who falls in love with the village doctor (Lew Ayres). Romance on the High Seas (1948) at 1:45 p.m. is a fun Doris Day musical about a romantic mix-up aboard a cruise ship that features great supporting turns from Jack Carson and S.Z. Sakall. Primetime Lineup: The ancient Roman epic Spartacus (1960) at 8 p.m. is simply one of the best films of the 1960's featuring sensitive direction by Stanley Kubrick and great performances from an all-star cast led by Kirk Douglas. Lust for Life (1956) at 11:30 p.m., about tortured painter Vincent Van Gogh (Douglas again), is director Vincente Minnelli's best non-musical film. 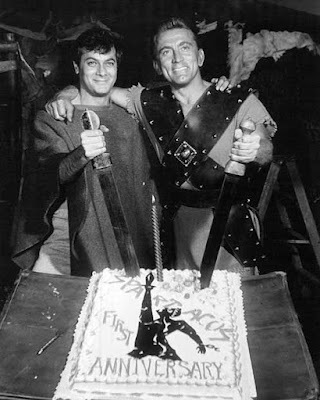 One Late Night Pick: Why not end the Oscarthon with a barrel full of laughs from Zero Mostel and Phil Silvers in the Stephen Sondheim musical, A Funny Thing Happened on the Way to the Forum (1966) at 1:45 a.m.
Daytime theme: A birthday tribute to Jean Harlow who was born Harlean Carpenter on March 3, 1911, in Kansas City, Mo. Harlow was one of the great stars of the 1930's, beloved by moviegoers for her glamorous platinum blonde looks and sassy demeanor. 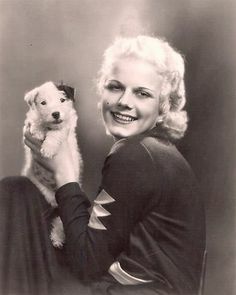 Early risers can start out the day with Platinum Blonde (1931) at 7 a.m. a fun rom-com from director Frank Capra that features Harlow as a seductive temptress who puts the moves on hapless reporter Robert Williams. The Public Enemy (1931) at 8:30 a.m. is a seminal gangster film from director William Wellman that brought Harlow into the spotlight as the girlfriend of bootlegger James Cagney (this is a great week for Cagney fans). My personal favorite Harlow movie is Three Wise Girls (1932) at 2:30 p.m., which features she, Mae Clarke, and Marie Prevost as friends trying to make a living in New York City. Primetime lineup: TCM is featuring movies condemned by the National Legion of Decency each Thursday night in March. First up is The Story of Temple Drake (1933) at 8 p.m. This movie, which is based on William Faulkner's novel Sanctuary, tells the story of a Mississippi woman (Miriam Hopkins) who is forced into prostitution by a bootlegger. Black Narcissus (1947) at 9:30 p.m. ran afoul of the legion for its frank depiction of the lives of nuns in the Himalayas. Late Night Pick: Design for Living (1933) at 11:30 p.m. is a sparkling comedy from director Ernst Lubitsch that features a love triangle between Gary Cooper, Fredric March, and Hopkins. Daytime theme: A birthday tribute to John Garfield who was born Jacob Garfinkle on March 4, 1913 in New York City. Garfield was one of Warner Bros. great stars of the 1940's, often appearing as a brooding, rebellious figure in films noir. One of Garfield's first starring roles was as a boxer who believes he killed his opponent in the ring in They Made Me a Criminal (1939) at 6:15 a.m. Destination Tokyo (1943) at 8 a.m. is a taut submarine thriller set in the Pacific Ocean that co-stars Cary Grant. The Postman Always Rings Twice (1946) at 6 p.m. is a great noir about a couple of illicit lovers (Lana Turner and Garfield) who plan to kill her schlubby husband (Cecil Kellaway). Primetime lineup: TCM kicks off its star of the month celebration of Merle Oberon with some of her best 1930's films. These Three (1936) at 8 p.m. is an adaptation of Lillian Hellman's play The Children's Hour about two teachers (Oberon and Miriam Hopkins) who are involved in scandal at a Massachusetts boarding school. 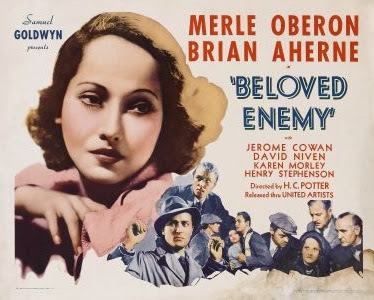 Beloved Enemy (1936) at 9:45 p.m. is about the love affair between an Irish rebel leader (Brian Aherne) and an English aristocrat (Oberon) during the Irish War of Independence. Late Night Pick: The Private Life of Henry VIII (1933) at 4:30 a.m. features a memorable cameo from Oberon as Henry's second wife, Anne Boleyn. TCM's primetime lineup features a heaping helping of William Holden. The night begins with this week's The Essentials pick, Sabrina (1954) at 8 p.m. followed by director David Lean's masterful World War II epic The Bridge on the River Kwai (1957) at 10 p.m. The night winds up with Holden playing a handsome drifter who crashes a Labor Day celebration in Picnic (1956) at 1 a.m. The Sunday Night Double Feature brings classic movie fans two great Doris Day rom-coms. Send Me No Flowers (1964) at 8 p.m. features Rock Hudson as a hypochrondiac who falsely believes he is dying. Before he shuffles off this mortal coil, he decides to pick out his wife's next husband with the help of his loyal wingman (Tony Randall). The Thrill of It All (1963) at 10 p.m. features Day as a housewife who becomes an unexpected TV celebrity after she appears as a pitch woman for a soap company. Her husband (James Garner) isn't too happy about this arrangement.